CEO Tim Cook told analysts that Apple is on track to meet a goal of doubling fiscal 2016 services revenue by 2020. "We feel great about hitting our objectives and maybe even doing a little better," he added. (Bloomberg) --Apple Inc. investors have wondered for years what comes after the iPhone. The answer is a growing collection of services and accessories that increasingly rely on the device, rather than replace it. The latest quarterly results confirmed that Apple isn’t selling many more iPhones these days. Instead, higher prices have driven growth. Revenue from the smartphone jumped 20 percent in the latest quarter as customers snapped up the $1,000 iPhone X. The average price was $724, up 19 percent from a year earlier. Chief Financial Officer Luca Maestri hinted that this leap in average selling prices won’t be repeated any time soon. "On iPhone ASP, the only thing that I would point out is that obviously we are exiting the June quarter at a significantly higher level than in the past," he told analysts during a conference call late Tuesday. "It’s important to keep in mind as we move into the September quarter." The comments suggest Apple doesn’t plan to increase overall iPhone prices much more. In addition to a lower-cost iPhone for this fall with facial recognition, the Cupertino, California-based company is planning a refreshed iPhone X and a new, giant model that looks like a bigger iPhone X, Bloomberg News has reported. Prices are expected to range from about $700 to $1,150 -- similar to the company’s current pricing. "Apple is approaching the upper limits of what it can comfortably charge consumers for the iPhone," Neil Mawston, an analyst at Strategy Analytics, said. "I definitely think there’s a ceiling. With AppleCare and the top phone, people are already spending about $1,500," said Abhinav Davuluri, a senior equity analyst at Morningstar Research Services LLC. 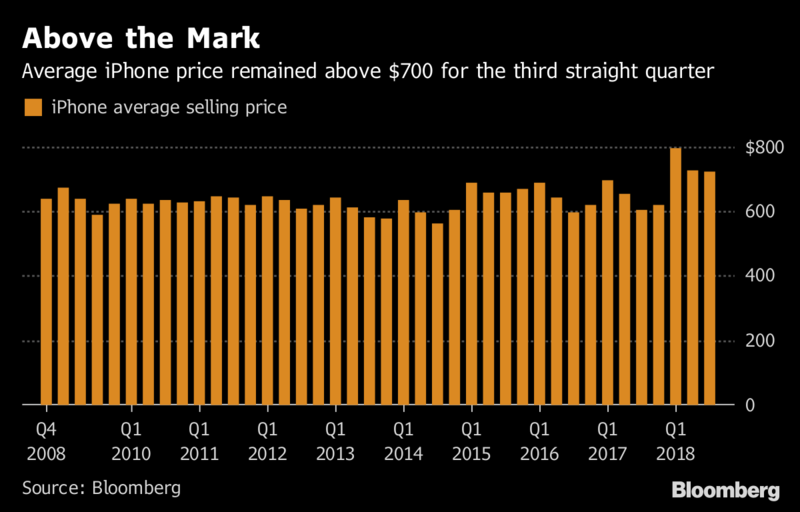 A year or two ago, the prospect of Apple hitting an iPhone price ceiling might have hammered Apple shares. Today, most analysts think Apple has a solution: Selling existing iPhone users services like Apple Pay and Apple Music and hardware accessories like the AirPods and Apple Watch. Apple reported a record $9.5 billion in services revenue during its fiscal third quarter, up 31 percent from a year earlier. Other Products revenue surged 37 percent. That helped the shares jump 5.2 percent to $200.18 on Wednesday, moving the company’s market value closer to $1 trillion. "Services are going to be the name of the game," Davuluri said. "Apple can extract more value from its iPhone installed base and that will be huge for growth." There are more than 300 million paid subscriptions for Apple services and third-party offerings, up 60 percent from a year ago Apple Music subscriptions grew 50 percent year-over-year AppleCare warranty revenue grew at the highest rate in 18 quarters Apple News articles read have more than doubled year-over-year Apple Pay transactions topped 1 billion in the June quarter, triple the amount from a year agoCook also said that the company has new services in the pipeline and confirmed work on an original video project that could compete with Netflix Inc. The company is also working on a new magazine subscription service, Bloomberg reported earlier this year. Cook told analysts that Apple is on track to meet a goal of doubling fiscal 2016 services revenue by 2020. "We feel great about hitting our objectives and maybe even doing a little better," he added. Most of these services will be accessed through iPhones, and some analysts are optimistic that users will continue to pay for new offerings from the company. "The Apple customer is a lot more well-off and has clearly shown a willingness to pay up for iCloud, AppleCare and other services," Davuluri said. "For the upcoming video service, all you need is one or two hits and people will try a subscription." Cook also cited accessories as an area growing around the iPhone. Apple’s AirPods headphones and Apple Watch are unique wireless products that fully work only with iPhones. The company doesn’t break out numbers for either product, but the CEO said sales of wearables surged 60 percent year over year. "Apple users have shown a willingness to try whatever Apple throws out there. Look at the reaction to the Watch and AirPods," Davuluri said.